I’ve blogged before about the curious activities of the Brent Liberal Democrat conniving promotion tactics and the con tricks they use here LINK. This is becoming usual practice when it comes to the Liberal Democrat candidate for the Dollis Hill by-election Alison Hopkins. Here I blogged about how the Lib Dems use her and plant her in stories in the local press as a “local resident” when she is a known activist for Nick Clegg’s Party as she even stood as a Council candidate in the 2010 Brent local elections as a Liberal Democrat candidate – LINK. Well it seems a quote from the Lib Dem was planted as coming from a “resident” in late February, when leaflets were going around in Dollis Hill Ward promoting Alison Hopkins. 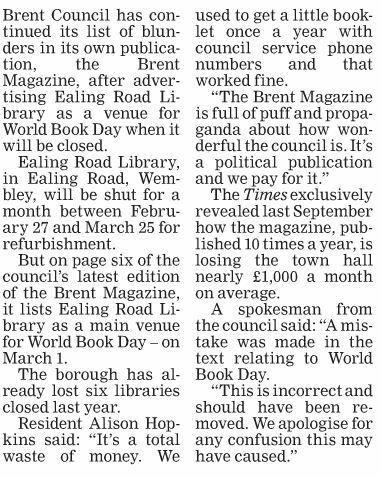 The Willesden and Brent Times have since realised this and pulled the quote from the online version of the article – but obviously it is impossible to amend printed versions of the article. They have sorrily explained that they did not know at the time she was a known local Lib Dem activist. Posted on March 18, 2012 March 16, 2012 by Cllr Krupesh HiraniPosted in Brent, Liberal DemocratsTagged Alison Hopkins, Brent Liberal Democrat, Dollis Hill, Dollis Hill Ward, Lib Dem, Liberal Democrat, Nick Clegg, Willesden.